If you are looking to scum down and try another game, then you should get your hands on the fantastic Rugby Star slot from Microgaming. Part of their sports series of slots, each offering 243-ways to win and the exciting Rolling Reels feature, there’s a potential jackpot of 120,000 coins to be won as well as a host of exciting features ready to play. Let’s kick off now by taking a closer look at the key features of the slot. How does the Rugby Star slot play? Rugby Star is a very well balanced slot. Nicely presented with the stadium backdrop and with lots of Rugby themed symbols on the reels, the base game has a great balance with the randomly triggered Wild Pass bonus turning up to two of reels 2, 3 and 4 completely Wild adding a great deal of excitement and the potential for decent base game wins. Three of the Rugby Ball scatters triggers the free spins round, which sees a Multiplier Trail used to increase the multiplier on successive Rolling Reels wins. Land up to five in succession and that Multiplier can grow to 10x the standard win offering the chance of some massive free spins wins. 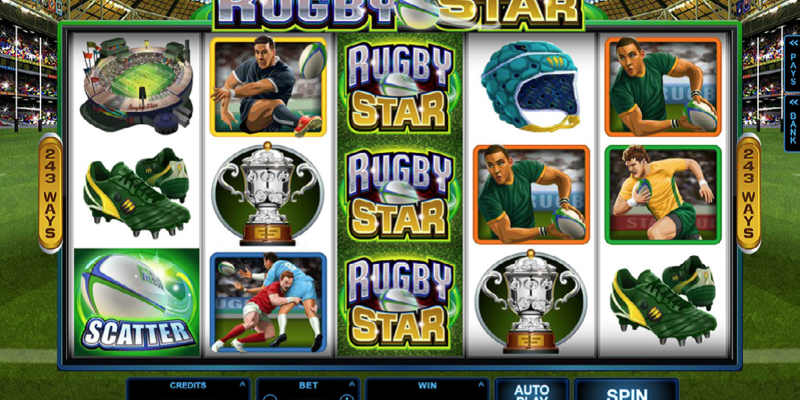 Initially, Microgaming’s Rugby Star slot may look a bit more complicated than a standard 5×3 game but in truth, once you have played through a few spins, you’ll have grasped the key concepts of the slot and you will certainly discover the added depth that Rolling Reels and 243-ways to win offers you over the standard payline slot. While the base game offers a nice mix of regular low value wins with the occasional big win (usually when you land Stacked Wilds or the Wild Pass bonus), it is the Free Spins round which offers greater potential reward with the Multiplier Trail and Rolling Reels features combining to offer players some very healthy wins.